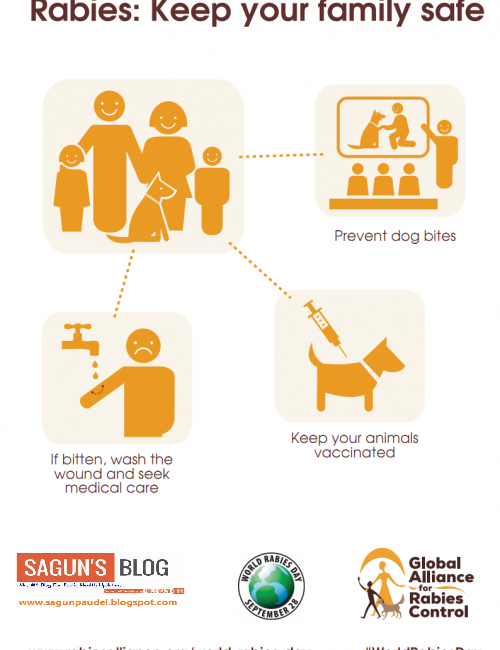 Today, safe and efficacious animal and human vaccines are among the important tools that exist to eliminate human deaths from rabies while awareness is the key driver for success of communities to engage in effective rabies prevention. The theme for 2016 is Rabies: Educate. Vaccinate. Eliminate. which emphasises the two crucial actions that communities can do to prevent rabies. It also reflects the global target to eliminate all human deaths from dog-mediated rabies by 2030. Rabies, passed to humans primarily through dog bites, is always fatal by the time its symptoms start, but it is entirely preventable. Washing wounds thoroughly with soap and water after a bite is an effective way of preventing infection, while both pre-exposure and post-exposure vaccinations for humans exist. Global elimination of the disease is feasible through mass vaccinations of dogs, which transmit 95% of rabies cases to humans. In December 2015, countries from across the world met with WHO, the World Organization for Animal Health (OIE), the Food and Agriculture Organization of the United Nations (FAO) and the Global Alliance for Rabies Control (GARC), and agreed to end human deaths from dog-mediated rabies by 2030.